A little while ago the retailer Pen Heaven contacted me and suggested that since a review of the Rotring 800 mechanical pencil was missing from my blog they would like to fill that gap by sending me one to review, and so here we are. When it comes to technical writing instruments few if any brands carry the weight of Rotring. Since being taken over by Sanford, (part of Newell Brands) back in 1998, Rotring has had its fair share of changes with many products being discontinued or converted to other Sanford brands. Luckily for us fans of mechanical pencils, Rotring have continued to sell a good range of high quality technical or drafting mechanical pencils, although they are now mostly Made in Japan rather than Germany. Rotring. Life long favourite of many an architect, artist, designer and engineer. The Rotring 800 really looks the part - hexagonal body with round sections at each end, red printing on black with gold highlights…very technical, efficient and classy looking. In the hand it feels as you would expect – heavy, hefty and solid, but well balanced. That’s the all-metal body for you. If you like a heavy mechanical pencil, then the 800 is your sort of pencil. Down at the sharp end the 800 has a standard technical drawing style 4mm lead sleeve. The whole tip section is retractable. To extend or retract the tip you twist the knurled section up at the other end, just above the pocket clip. It is quite a positive twist action, clicking firmly into place, and springing back when released. The grip zone is 8.2mm diameter so a reasonably average thickness and it is knurled to enhance grip. The knurling is very fine, about as fine as you will find on any writing instrument. Personally I find this sort of knurling the best. It’s easy to make coarse rough knurling that will rip your skin with extended use, so Rotrings super fine knurling should provide excellent grip without skin irritation over many hours of use. A good grip is always important. The lead advance mechanism is a standard push top ratchet, and ten clicks will advance about 7mm of 0.5mm lead. However, the first click basically doesn’t count as virtually no lead will ever appear out of the sleeve with your first click. The other aspect worth mentioning is that the clicking is a very squishy one, definitely not a sharp precise experience. The first millimetre of the action is without resistance and you are pushing the entire mechanism and tip forward until they meet their end-stop, and then the lead clutch mechanism is engaged by your continued push. As I said, it is a very squishy experience. Those of you who like a good solid and audible click will not like the 800 experience. When the tip is retracted, the lead advance mechanism is disabled. Beneath the push top button is a small emergency use eraser. There is also a lead clearance rod which is an increasingly rare accessory these days, so good on you Rotring for including one. You remove the eraser to access the lead refill magazine. The Rotring 800 mechanical pencil has been around for a while now, and whenever it comes to discussion of its features there is a heffalump sitting quietly in the corner… tip wobble. High end metal bodied Rotrings like the 800 are heavy pencils and whilst 4mm long lead sleeves are strong, if you drop your Rotring from a reasonable height onto a hard floor then there is a good chance that your long slim 4mm lead sleeve is not going to be straight anymore and that’s probably the end of your mechanical pencil. The retractable tip, or vanishing point mechanism as I like to call it, is then the Rotring 800’s standout feature. Retracting the tip makes the pencil pocket safe and far less likely to have its lead sleeve accidentally damaged. But, there is a price to pay. A retractable mechanism is a moving mechanism, and movement generally means things are not as rigidly fixed as they could be, so the 800’s standout positive feature is also its standout negative talking point. So, how much tip wobble is there? Well, there is certainly some, enough to be noticeable if you are aware of it but perhaps not enough that you would notice it if you did not know about it in the first place. Various forums discuss this matter at length, and possible ways to reduce wobble using tape, etc. For me personally it is not that big a deal, but some people value extreme rigidity and precision, and so for them, it is. The pocket clip is very strong, possibly too strong for easy clipping to paper. The hexagonal body and pocket clip combine to limit rolling on your desk. Rotring, for designers now and into the future. If you look really hard you can find the word "Japan" on your pencil. In summary then, the Rotring 800 mechanical pencil is a worthy member of the Rotring pantheon. If you like a heavy metal bodied pencil, like the idea of a vanishing point mechanism and do not place extreme importance on tip rigidity or positive clicking, then the 800 is most definitely worthy of your consideration. Dimensions – Length 143mm extended, diameter 8.2mm across the grip section. Balance point about 75mm up from the tip. Disclaimer: For the purposes of this review, the retailer Pen Heaven provided this Rotring 800 mechanical pencil to me free of charge. The Insignia was one of Parkers top of the line writing instruments, and was produced from 1991 to 2008. Here today for your viewing pleasure I am showing four of them – two ballpoints and two mechanical pencils. Insignia’s carry production date letters so I can say the items shown here span virtually the entire period of production. The Insignia is a fairly long slim pen and the decoration is all about the long lean stripes running down its length. Some only have the stripes on the top half. The classic black and gold combination. Insignia - gone but not forgotten. Ok, well I'll give Google Forms a go. What is your preferred lead size? This is the link to the multiple choice survey form. You can click on it, or copy and paste into your browser address bar. Poll is now closed. Thanks to all who voted and commented. I will publish the results shortly. Well that's annoying. I thought, "Hey, time for a poll or two. Haven't done any for ages". Now I discover Blogger discontinued their in-built native Polls widget back in May, so no more polls. There are some third-party widgets I could use but apparently they are all prone to popping up ads of a questionable nature for things unrelated to this blogs subject matter. Back in the mid 00's there was an outbreak of the dreaded Rubber Madness in the Avery design department. They got swept up in some sort of mass hysteria and next thing the Avery Nexgrip ballpoint pen and the Avery doubleClick multi-pen ended up in my hands. Urggghh! Now you know I would never buy those rubber horrors, so don't ask me how I got them, I just did, okay. It's awful. I worried about breaking out in hives when I first touched the Nexgrip. Not so terrifying, but still enough to put me in a spin, the doubleClick multi-pen. Only a partial rubber body :) It is a twist action multi with one ballpoint tip and one 0.5mm mechanical pencil tip. But there's more bad news. Another red card for Dave! In my One-Man War Against 'Double Knock' it appears that like Vanishing Point, Double Click is also toast. Luckily the I think the rubber madness outbreak has been brought under control at Avery, because I believe both are discontinued. The TWSBI Jr Pagoda mechanical pencil was released onto the market in March 2018 so is still a fairly new kid on the block. I imagine many readers will be aware of TWSBI, but for those who do not, they are Taiwanese manufacturer of writing instruments. Their roots are as an OEM manufacturer from the 1970’s but in recent years they have been releasing products under their own brand TWSBI. When I was thinking about background images for use with this post I thought to myself, “Hey, this is a Taiwanese pagoda, I’ve taken photos of those”, nostalgia set in, and I went digging in the archives. So, in something of a first, the background images in this post are mine too. Yes indeed, I have been to Taiwan, I have seen the pagodas, I took photos on good old fashioned film… because back then film was not old fashioned and every mechanical pencil I saw in Taiwan would now qualify as “vintage”. What then is in a name? Why is this mechanical pencil called the Jr Pagoda? Is it because Jr has an older bigger sibling in the Precision? Will there be a Sr Pagoda? A maxi? I don’t know, and Google couldn’t enlighten me either. I also could not find any reference as to why it was called Pagoda, but you know what, as soon as I saw the pencil and its name pagoda, I made the connection. The conical tip, the rubber grip strips showing the body underneath… somehow the overall look just resonates with pagodas. Don’t ask me to explain it because I can’t, so I fully understand if there’s no connection in your opinion. Right then, enough of this waffle, on with actual pencil stuff! The Jr Pagoda is currently available in three colours (white, blue and marmalade) and two lead sizes (0.5mm and 0.7mm). As you can see, mine is blue 0.7mm. First impression, the Jr Pagoda looks like a quality pencil, and the styling is perhaps a little retro. Weighing in at about 12 grams it is relatively lightweight in the hand. The gloss foil stamping of brand and details on the body is well executed with no missing sections or feathered edges. According to the TWSBI website the body is made from ABS plastic, which is a particularly strong and visually good looking plastic, well known for its mechanical strength and impact resistance but not so much for its scratch resistance. However all plastic and metal bodies suffer from wear and abrasion over time so let’s not make too big a deal out of that statement. The body cross section is a mixture of round and hexagonal areas and the pencil has no resistance to rolling on your desk apart from the pocket clip. 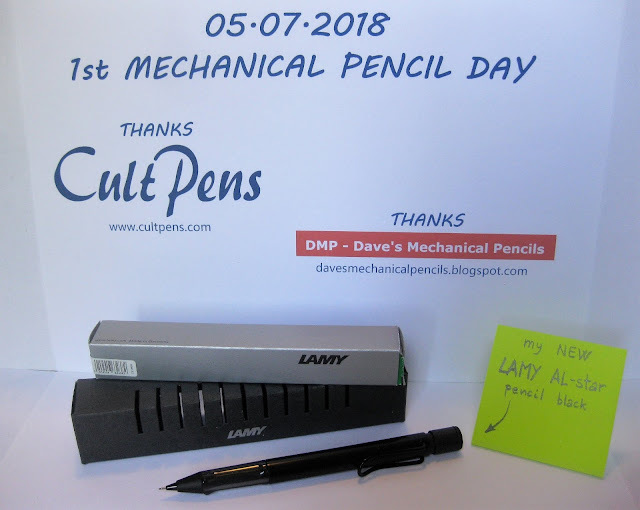 The lead sleeve is a fixed 4mm metal pipe so this is not a pocket safe mechanical pencil but is usable as a drafting pencil. The push top ratchet lead advance mechanism gives you about 9mm of lead for 10 clicks. The mechanism feels and sounds sturdy. Underneath the top cap is the eraser. This ‘longer than usual’ eraser is a feature of TWSBI mechanical pencils. It is the same small diameter as most other erasers that I classify as emergency use only, but is much longer. It can be pulled up inside its holder as it worn down by use. This is an interesting feature, and definitely makes it more useful than many erasers, but it still remains a fairly small eraser. It is still somewhere in the middle of the two inbuilt eraser theories – the ‘emergency use’ and the larger ‘fully extendable’. I won’t be ditching my separate block eraser anytime soon. I do think it would have been appropriate for TWSBI to have included a lead clearance rod as part of that eraser holder. As you can see the rubber grips are a series of strips on the flats of the hexagonal section of the body. Now you know rubber grips are not my favourite thing but I really quite like the visual aesthetics of this grip zone. The rubber grip is itself relatively hard and not particularly grippy. I am tempted to think they could have produced an equally pleasing and effective grip by using some plastic insert or other section and dispensed with the rubber. The pocket clip is a solid reliable one, and its attachment arms are very exactingly recessed into the body. That’s a small piece of good quality work, but it does mean the pocket clip is not removable. Overall then this mechanical pencil rates pretty well for its price point. • Best Points – Solid and sturdy. • Not So Good Points – It rolls a bit. Dimensions – Length 142 mm, diameter 9mm across the grip section flats. Balance point about 65mm up from the tip. Acknowledgement: This TWSBI Jr Pagoda mechanical pencil was gifted to me by Cult Pens without any request for a review. Thanks Cult Pens. Just a quick post, updating the two Giveaways back in July. First there was the Mechanical Pencil Day Giveaway, thanks to Cult Pens. Winner Stefano got into the spirit of things and has sent this great picture of his new mechanical pencil. Then there was my personal Filofax Giveaway. Winner Dan Goldman has sent these photos of the Filofax family reunion.